The lumberjack looms closer to the Turtles with his chainsaw, angry that they tried to “come between man and the forest”. He’s about to saw them into pieces when a small monkey drops a coconut on his head. The lumberjack yells at the monkey when a gargantuan gorilla dressed in commando gear appears behind him. The gorilla disarms the lumberjack, but the villain calls in more of his friends. The Turtles wish they could even the odds, but they’re still bound. The small monkey chews through their bonds, though, and they join the fray. Ultimately, the lumberjacks are defeated. When the fighting is through, the gorilla introduces himself as Guerilla Gorilla and shakes Leonardo’s hand. Donatello asks what business an African gorilla has in South America and Guerilla replies: “Monkey business”. Because we all needed to hear that, today. 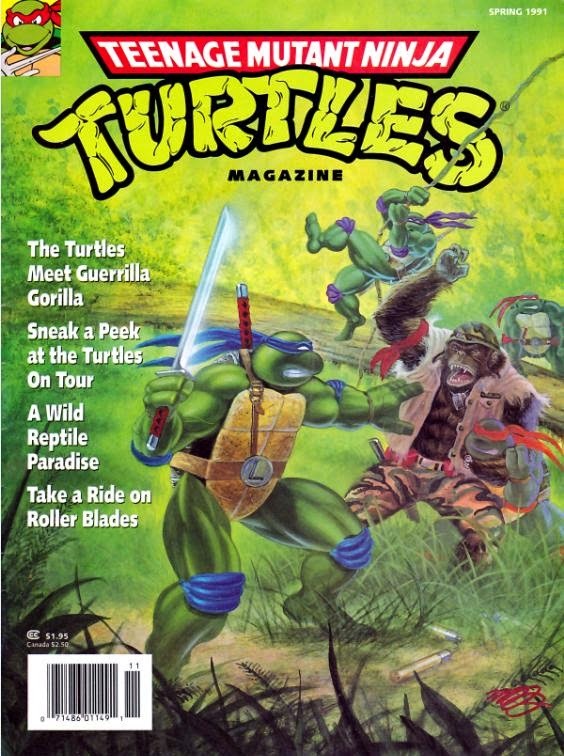 *This story is continued from TMNT Magazine (Welsh) #3. The story continues in TMNT Magazine (Welsh) #5. 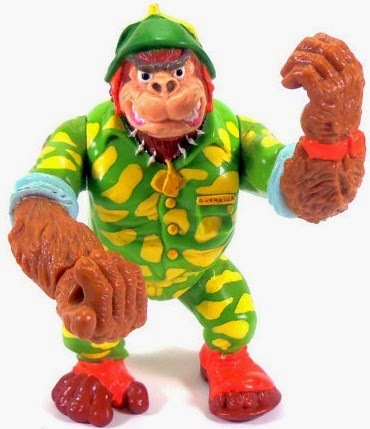 *Guerilla Gorilla is the same character as the Playmates toyline character Sergeant Bananas (whose toy even sports a nametag reading "Guerilla" on it). Much like Warrior Dragon/Hothead and Man Ray/Ray Fillet, he received a name-change between comic and toy either due to marketing or trademark issues. *So far as I know, this is Guerilla Gorilla/Sgt. Bananas’ only appearance in fiction. Sergeant Bananas. Wow. I love these comics. 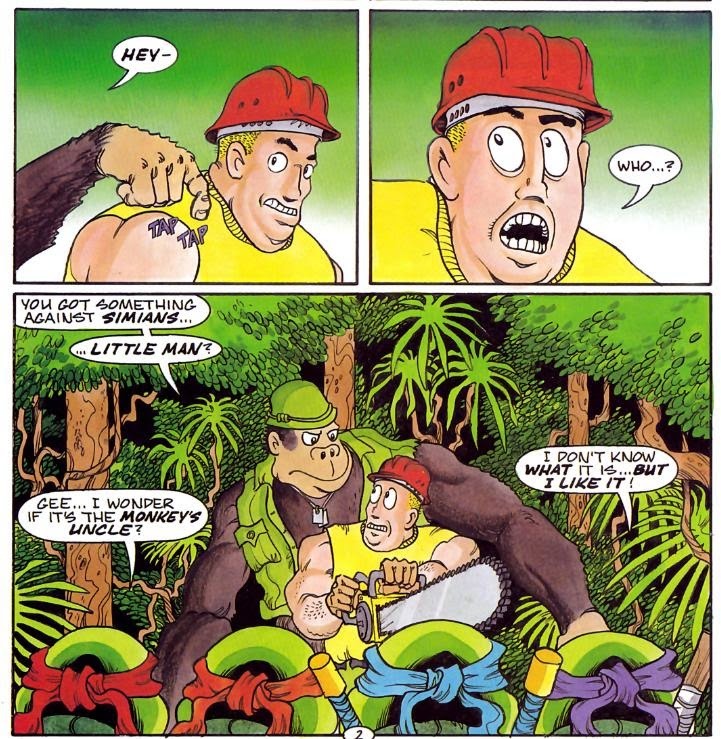 They’re such a weird little treasure trove of TMNT odds and ends, introducing prototypes of characters who would go on to appear in Archie’s TMNT Adventures comic or just the Playmates toyline. These aren’t, uh, GOOD comics. No, they aren’t that. But they’re definitely fascinating for the character selection. The plot, of course, hinges on more of Steve Muphy’s (Clarrain’s) eco preaching and in 4 pages it all feels a bit muddled and half-baked. The Turtles rush to South America to save the rain forests, as they consider the lumber industry to be villains and criminals. Okay, sure. But why does the lumberjack work for McDonald’s? I’m guessing Murphy wanted something with a symbol that represents “corporate America” and the double arches had the most brand recognition, but unless he’s chopping down those trees to make paper cups and straw wrappers, the commentary doesn’t make a whole lot of sense. Murphy could’ve just put a generic “Evil Co.” logo on his shirt. Of note, though, is that this issue actually initiates a 3-issue story arc; the ONLY story arc in TMNT Magazine. Weird. It's more "save the rain forest" stuff, so don't get too excited. Anyway, not a good story, but darnit if I’m not happy to see a forgotten Playmates toy character get at least one scrap of fiction. I’m not exactly holding my breath for Monty Moose or Halfcourt to show up later on (they don’t), but this was still a pleasant surprise. The term guerilla gorilla is used in the bio for Sergeant Bananas. Also why would the lumberjack want to murder the Turtles? He found four giant talking turtles. He could probably call the media and become rich and famous. Do you know if IDW has the rights to these Magazine comics? I'd love to see them reprint these comics as back-up stories in their Archie trades or something. Most of us have never read these magazine comics. I seem to recall reading enviromental stories in the early 90's where restaurants like McDonalds were portrayed as chopping down the rainforest to make more space for cows to graze before they were turned into hamburgers. 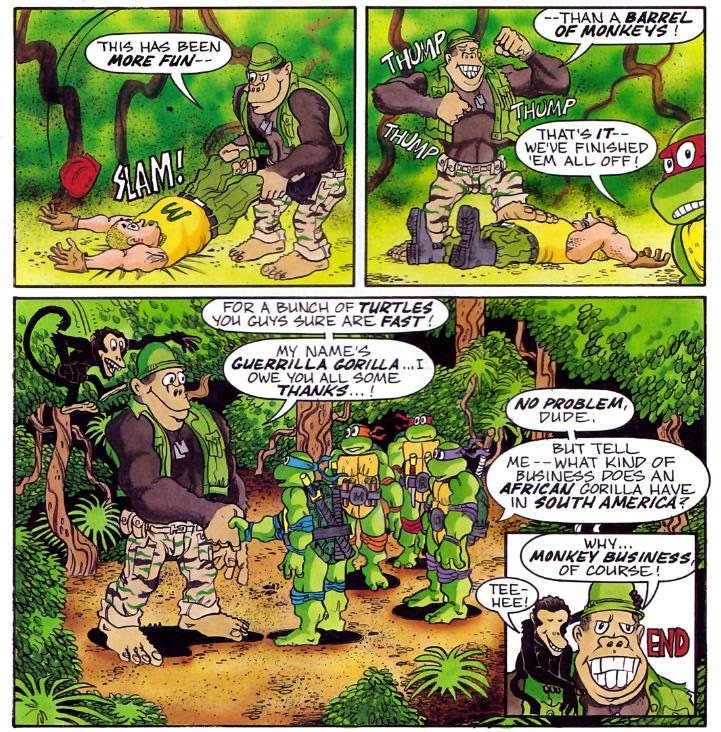 So, Playmates turned an obscure one-shot gorilla mutant from a three-page comic strip in a magazine that was just published in Wales into an action figure, but they never had any intentions on releasing action figures of popular Archies characters such as Ninjara, War or Dreadmon... Stupid. @ Chet I assume the toy was first.